I know I’ve hit the snooze button on posting as of late – While that $9.94 that I’ve racked up through AdSense in the past 3 years is compelling motivation, summer is my favorite time of year and there is so much more for me to do. This year we were able to get the pool going and I’ve been busy reading while floating – I’m not planning to try typing up a post while floating. 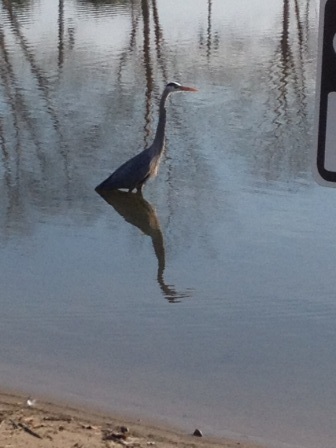 I also continue to frequent Crossings Park of Colonie. For this posting, I’m going to share some of my favorite pics from the Crossings for 2016. These photos were all taken on my iPhone 4s. 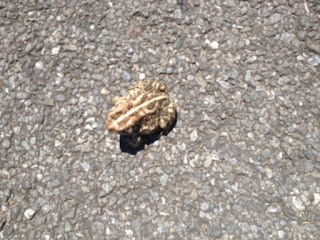 On a very recent trek to Crossings Park, I encountered this toad on the path. 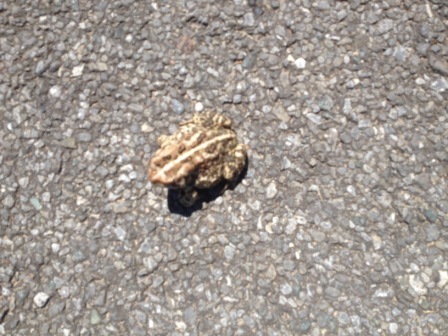 I was somewhat ambivalent in regards to taking the picture as I thought a toad would make for pretty boring subject matter… (yeah, I can almost hear some of you saying that if it’s boring, it would be a good fit for this blog…) Regardless, after having the Google Photos app back it up from my iPhone, I viewed it on my iPad and found that I really appreciated the way the pattern of the toad blended nicely with the pattern of the asphalt path. 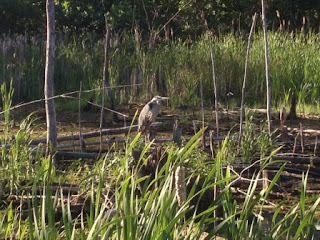 One of my favorite subjects in Crossings Park is the Heron – I refer to it as a Blue Heron, but it is entirely possible that it may be some other variation of Heron. 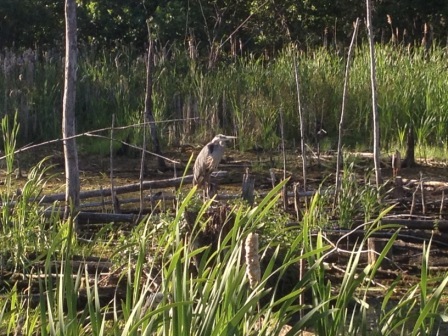 The Heron of Crossings Park is trickier to photograph, particularly on an iPhone 4s where your zoom is much curtailed. Nonetheless, I have several shots from this year including one where the Heron is perched in the swamp area that is adjacent to the playground and another where the Heron is on the hunt and casting a long shadow in the water and another photo where I caught the majestic Heron in flight. 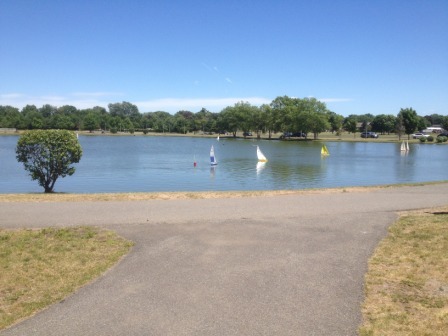 At the pond in Crossings Pond, you may find visitors navigating their miniaturized boats by remote. 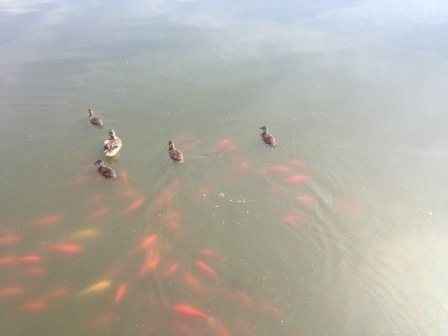 On just about every warm day, you will see ducks, fish and turtles. 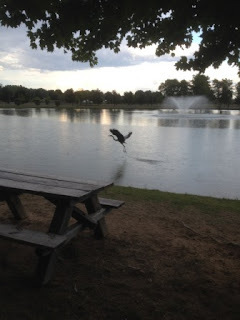 Hawks can be seen on occasion at Crossings Park. 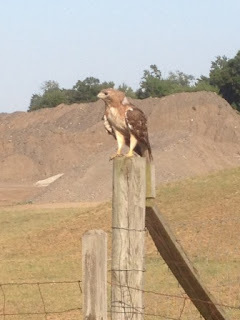 Often they are at considerable distance, but on this happy occasion, I was traveling southwest on the path that runs adjacent to Constantine Farm and was able to capture this close up of a hawk perched on the fence. Cow viewing is a popular activity at Crossings Park. 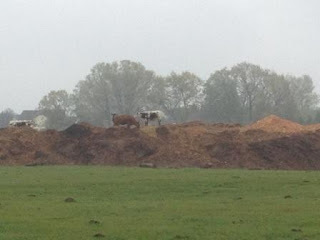 The cows are at adjacent Constantine Farms… I think these cows might be part goat as they seem to really like climbing the mounds on the farm. 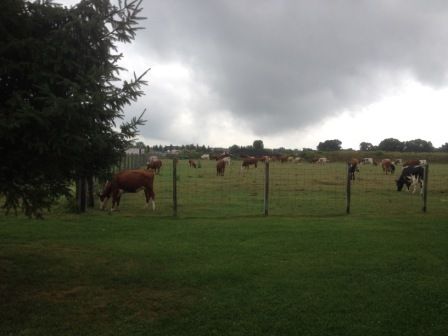 Another favorite photo came a day or 2 after the debut of Sharknado 4… Looking off into the sky, it looks like a Cownado is ready to hit Constantine’s cows. In experimenting with pictures, I have found that the iPhone 4s does a nice job with daytime still photos. 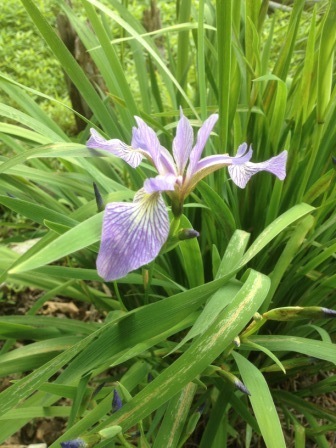 One of my favorites is of an Iris blooming near the swamp area (adjacent to the playground).The iris photo is now a background on my iPad. I have additional photos of Crossings Park from over the years posted on my Crossings Park page.